Although Muslim have been wrongly taught about Jesus the Messiah by their religious leaders, many of them are now coming to faith in the real Jesus of the Bible. Charisma Magazine wrote an interesting report that states, “…a tsunami of faith is quietly overtaking the Muslim world. Islamic adherents are laying aside their allegiance to Muhammad to follow Jesus Christ, despite the social ostracism, persecution and possible martyrdom that converts to Christianity face.” Middle East expert Joel Rosenberg believes more Muslims have come to faith in Christ in the last 30 years than at any time in history. “The vast majority of those conversions have happened since 9/11,” he notes. He relates some of their stories in his book, Inside the Revolution. Jesus was not the Son of God but merely a messenger (prophet). Jesus was not crucified, nor did He ever resurrect from the dead. Anyone who believes in Jesus as the Son of God will be accursed. 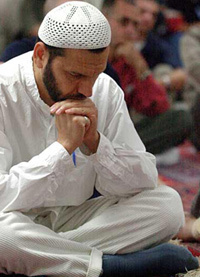 But despite these erroneous ideas about Jesus, many Muslims are seeking the truth and discovering the real Jesus is indeed the Son of God and the Savior of all mankind. May the LORD burden us to pray for and witness to the Muslim people. They need our Christian love and compassion just as much as any other race of people in the world. Below are some examples of Muslims who were hungry for the truth and received Jesus as their Messiah. A Shiite Muslim from Iran, Reza Safa met Christ after studying the Bible with two Charismatic Lutheran missionaries in Sweden. This interaction prompted him to wonder, What if Muhammad is not of God? Because of Safa’s conversion his family disowned him, and his Muslim friends verbally attacked him. Death threats continue today. Unbowed, he enrolled in Bible school and soon became a traveling evangelist. In 1990 he settled in Tulsa, Oklahoma, and attended Rhema Bible Training Center. In 1998, God told him he would play a role in a massive, coming revival. Five years later God told him he’d receive $90,000 from a businessman, which happened, and to use $40,000 of it for a TV program. Safa began filming Farsi-language shows and soon met several Iranian owners of satellite stations. One accepted his offer to purchase airtime. Safa’s three-hour weekly program became the TBN Nejat network, a joint venture with Trinity Broadcasting Network that blankets Europe and the Middle East. Since September 1, 2006, the network has received 300 calls and e-mails a week from up to 30 countries that have led to hundreds of thousands of conversions. As her mother’s health rapidly deteriorated, Asal became disillusioned with God and wanted to commit suicide. She and her mother decided to kill themselves together, using sleeping pills and natural gas. Stunned, Asal returned to the couch to listen. Her mother wanted to call the station to tell them they were lying. When she did, she accepted Christ after talking to a pastor for 10 minutes. Then Asal reluctantly took the phone and talked, finally agreeing to allow Jesus to come into her life, but only on the condition she could still commit suicide if He didn’t do anything after a week. The next morning Asal felt a peace so profound she thought it was a mind game. But when they went to the hospital and her mother’s MRI showed no signs of MS, she knew Christ was real. A singer so dedicated to the Nation of Islam that he wore the organization’s trademark bow tie on the cover of a Harold Melvin and the Blue Notes album is now an itinerant evangelist who estimates his ministry has led 280,000 ex-Muslims to Christ. Jeremiah Cummings was part of the pop group for about nine years before he moved to Dallas in 1981, where he went to work for General Motors. His involvement in the Nation of Islam led to a chance meeting with its leader, Louis Farrakhan. By the time he rose to become a top captain to Farrakhan, Cummings was known as Minister Jeremiah Fard Muhammad. Although he oversaw numerous bodyguards and employees, he still had ample time for reflection. In 1996 Cummings returned to his biblical roots and undertook a 13-month long study of Christ. At the end, he fasted and prayed Psalm 23 five times a day. On the 43rd day, he accepted Christ and got filled with the Holy Spirit. A few hours later, he wrote a letter of resignation to the Nation of Islam. “I knew Jesus was the Son of God and that there was power in His name,” Cummings says. Since then he has founded Amazing Life World Outreach in Orlando, Florida, and written several books, including Reaching for the World: Revealing Jesus as the Messiah in the Koran. “I’ve taught things from the Quran about the virgin birth of Jesus and relation of stories in the Quran to the Bible,” he says. A former imam and Islamic history professor in Egypt, Mark Gabriel is familiar to many readers of Charisma, which has featured excerpts from some of his first five books. Before turning to Christ in 1992, he was expelled from the university and jailed for publicly questioning why Islam had such a violent, bloody past. Gabriel [a name he assumed after immigrating to the U.S.] came to Christ after a pharmacist in Egypt-alarmed by his frequent visits to the store for medication-gave him a Bible and made him promise to read it. He accepted Christ after staying up all night reading, especially touched by Jesus’ Sermon on the Mount in Matthew 5. Gabriel survived several attempts on his life and later came to the U.S., where he speaks and worships freely. He maintains contact with his homeland, where tens of thousands of Christians have formed underground churches, he says. While his several books have angered Islam’s defenders, his latest, Coffee With the Prophet, may stir their ire even more. The cover design violates a centuries-old tradition against any depiction of Muhammad. Gabriel formed a publishing company and released the book in September. Subtitled 21st Century Conversations With Muhammad, it is an attempt to show how Muhammad’s followers have distorted the views of Islam’s founder the last 1,400 years. Sofia Hasina* has had a challenging time since deciding to follow Christ and has endured a life riddled with uncertainty, poverty and homelessness. Hasina’s parents died when she was an infant. Her uncle, a ship’s captain, promised to look after her. Though he paid for her schooling, he was forced to leave her in the care of an aunt because of his frequent absences. A good student, Hasina befriended other students who happened to be Christians. After spending considerable time with them, she asked them to tell her about Jesus. Hasina accepted Christ, but her friends were ill-equipped to disciple her. Through relationships she made with members of an underground ministry she showed rapid spiritual growth. The ministry leaders advised her to keep her decision a secret to avoid premature exposure. Despite following their advice, she was not able to hide the inner changes. Her family became suspicious, asking her about her increased absences from the mosque. They also wanted to know why she spent so much time with Christian friends. One day, while Hasina was fellowshiping with friends, her family discovered a Bible in her bag. When she returned home they were waiting angrily. The father of the house demanded to know where she had received the Bible. When she told him it came from a friend, he insisted she take an oath declaring her loyalty to Islam. When she revealed she had become a Christian, he tore pages from her Bible. Fearing for her life, she ran away. Although her guardian parents didn’t pursue her, they threatened to kill her if she returned home. Hasina is struggling to make ends meet while working in a cafŽ and staying with a friend. She hopes to continue her university studies, but might need financial help from an uncle. She doesn’t know what his reaction will be if she reveals her conversion. A Sunni Muslim born in Pakistan, Faisal Malick was a budding young businessman when he attended an Amway convention in July 1994, hoping to keep his front-row seat all week by arriving on Sunday morning. “As He said it His voice moved through my being and everything I had ever known up to that moment shattered,” Malick says of the life-changing experience. Though he soon found himself locked out of a family-owned rental house in Canada, several years later he returned to Pakistan and was reconciled with his family. Malick remained in business for a while, but his love of Christ ultimately led him into ministry despite his lack of a formal education. Malick has also written four books, including The Destiny of Islam in the End Times. One of his goals is to help people understand that Muslims have a promise from God, made to their ancestor Ishmael (see Gen. 21:18). Since the publication of his book last January, the author has received numerous letters from churches telling him that his book has given them hope for the first time since 9/11. “The other thing people are saying is, ‘We are repenting and praying to have a supernatural love in our hearts for the Muslim people,'” Malick says. Although few recognize Raghib Ismail by his first name, football fans know him as “Rocket” Ismail. A star at Notre Dame, “The Rocket”-a fleet receiver and kick returner-played 11 years of pro football, nine in the National Football League. Injuries ended his career in Dallas, where he now works on a Cowboys post-game show, appears in reality TV programs and helps his wife with her Christian recording company. Ismail became a Muslim at birth. His father converted after observing racism in Georgia and assumed that the Christianity embraced by whites there was a lie. Young Ismail took his faith seriously. By age 9, he and his brothers had memorized 40 surahs, or “chapters,” of the Quran. “I’d say we were definitely committed to it,” Ismail says. However, the spiritually sensitive youth was plagued by nightmares. The remedies his father recommended to chase away the demons didn’t work. Things changed for him after his father died and he went to live with his grandmother, who was a member of an Assemblies of God church. She insisted that if he and his brothers wanted to eat, then they had to attend services. Due to that exposure to Christianity, Ismail at age 13 stood at a concert by Christian artist Leon Patillo to accept Christ. Though he later slid back into his old ways, he also realized at age 24 that having money, fame and “cool things” was like repeating his childhood nightmares. The son of a high-ranking Army officer, David Nasser fled with his family from Iran in 1979 after the Islamic Revolution overthrew the monarchy. Ironically they still considered themselves good Muslims, even though their faith was primarily cultural. After several moves, the family settled in a military town in Alabama. There Nasser struggled to fit into the strange customs and new faces around him. A month after his high school graduation, he visited a Baptist church his friends attended. Thanks to the friendliness of a classmate he had treated rudely in the past, he returned. Though he initially resisted the Holy Spirit’s call to follow Christ, he picked up a Bible two months later and read the account in Matthew 14 of Jesus calling Peter to walk on water. The week after his conversion, Nasser spoke at a pastors conference-and started a ministry that first saw him travel with Rick Stanley (Elvis Presley’s stepbrother) and Jay Strack. After graduating from Bible college he founded D. Nasser Outreach and today speaks to more than 700,000 people a year. He is also the author of several successful, self-published books. After overcoming resistance from his family and other Muslims, Nasser no longer faces much hostility. Still, he hopes to win more Iranians to Christ. If they follow Nasser’s pattern, they’ll get out of the boat. The leader of a budding prayer movement in London with hopes of packing Wembley Stadium in 2010 with 90,000 Christians is a native of England who spent his formative years in Nigeria. Jonathan Oloyede is senior associate pastor of Glory House, a megachurch in East London with a network that extends far into the city. Some 300 congregations are involved in the 24-7 prayer initiative. Oloyede accepted Christ during his first year of medical school in Nigeria and credits his decision to Christians on campus who prayed for him. He was filled with the Holy Spirit the same night. After earning his degree in 1991, Oloyede came to England on a summer holiday, still with plans to become a medical aide in Nigeria and then to go to China as a missionary. Instead, God told him he was in England to help prepare the way for the return of His Son. Like many Muslims who come to Christ because of dreams and visions, Oloyede has had numerous visions. He says the key ones concern a coming revival that he believes will have worldwide impact. “The Lord told me not to start anything new but to act as a catalyst for national, united prayer,” he says. Categories: Muslims finding the Real Jesus, TESTIMONIES OF FAITH | Tags: Christ, Christian Witness, Christianity, Islam, Muslims finding Jesus the Messiah | Permalink.